Cities are enjoying a rebirth through reinvestment and reuse of existing places that invites preservationists to reach for the next level of impact in shaping the communities we love. All across the country, more Americans are being drawn to older and historic neighborhoods to live and work. The National Trust has been involved with the revitalization of cities for decades. With strategic focus and organization-wide commitment, the Trust now has the opportunity to promote the reuse of older and historic buildings as the default option in American cities. Using new research, data, tools, and strategies, our commitment to the reuse, reinvestment, and revitalization of cities—which we describe as ReUrbanism—seeks nothing less than to transform both the perception and practice of preservation, responding to the issues cities face today. ReUrbanism positions preservation in the larger context of human needs. 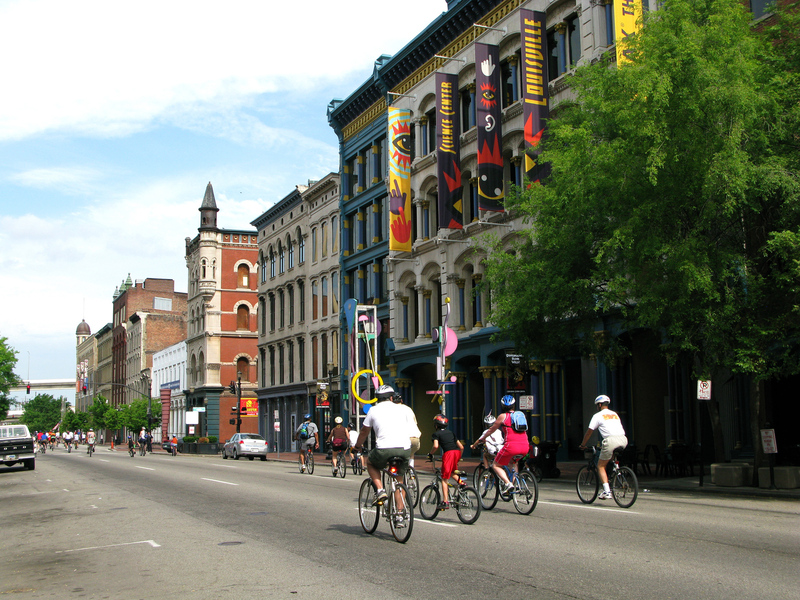 We know preservation is an element in livable, vibrant, equitable, and creative communities. Preservation provides character and identity, contributes to sustainability and walkability, fosters a sound economy, spurs creativity, and gives people the psychological and sociological sense of stability they need in an ever-changing world. Yet, while the preservation of our older and historic places is critically important to a community, it is only one part of the various elements that make a community livable and vibrant. Through ReUrbanism, preservation seeks to work in tandem with and support the many other fields that contribute to livable and vibrant communities, including planning, natural conservation, economic development, health and welfare, social justice, and sustainability. Cities are only successful when they work for everyone. People are at the center of our work. Preservation projects can create opportunities for community residents at all income levels to live, work, and play in a diverse and thriving environment. Older places provide the distinctiveness and character that engender success. Older buildings give cities a sense of identity, history, and authenticity—which is the most important competitive advantage they can have in today’s economy. Older neighborhoods are economic engines. Research shows that neighborhoods with a mix of older and newer buildings perform better along a number of social, economic, cultural, and environmental metrics than areas with only new buildings. New ideas, and the New Economy, thrive in older buildings. All over America, the most innovative companies of the 21st century are choosing to make their homes in older buildings. These buildings fuel creativity by being distinctive, character rich, endlessly adaptable, and often low cost. Preservation is adaptive reuse. Adaptive reuse is preservation. Historic preservation is not just about keeping old buildings around. It is about keeping them alive, in active use, and relevant to the needs of the people who surround them. Preservation is about managing change. Healthy, dynamic neighborhoods are always in the process of change. Historic preservation is about managing change: unleashing the enormous potential of older buildings to improve health, affordability, prosperity, and well-being. Cities are for people, not vehicles. Reclaiming city streets and making them more amenable to pedestrian and mass transit use can help neighborhoods reacquire activity and thrive once more. The greenest building is the one that’s already built. It takes energy to construct a new building—it saves energy to preserve an old one. It simply does not make sense to recycle cans and newspapers and not recycle buildings. There are many ways to achieve density. Areas with a mix of older and newer fabric tend to be denser than new-only neighborhoods, and they achieve that density at a human scale. Every community has stories and places that matter. The places worth saving are those where communities choose to come together and that represent the local stories they treasure and wish to see preserved.